We shopped at ValuMarket at the Hurstbourne Plaza location and found several grocery options and services all under one roof. They also offer home delivery for locations within a few miles. Or, you can order online and pick up your order for an extra $5.95 without having to take the time to shop. Here are three easy meal ideas using items you can find at ValuMarket. 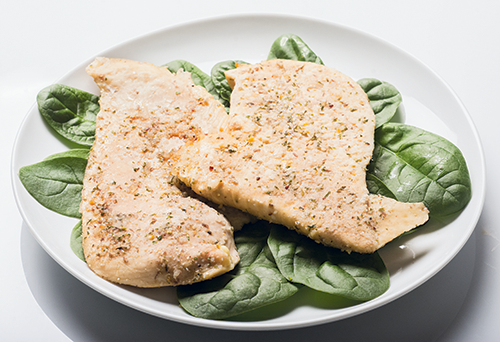 ValuMarket’s Poultry Cranberry Herb Rub is a great way to add flavor to chicken. Whether you are cooking a whole fryer, individual cutlets, or bone-in pieces, this rub is delicious and easy to use. We suggest sprinkling it on your chicken the night before and baking it the next day because the flavor intensifies after a few hours. It’s a great way to add some flavor to chicken salad, soup, or pot pie. This is one of our favorite features in the whole store! ValuMarket’s hot food in the deli section offers homemade food — fast. Choose an entree and one or two sides. You can purchase entrees and sides individually as well. 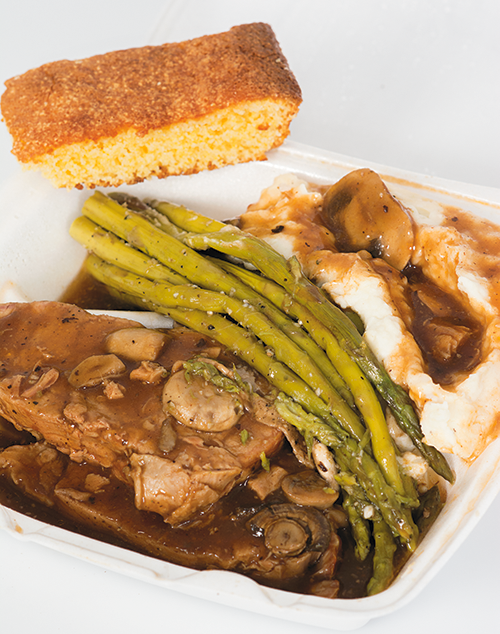 We chose the pork loin with mashed potatoes and gravy and roasted asparagus (bottom left). The meal also comes with an option of roll or cornbread. Other hot food options available the day we were there included meatloaf, Salisbury steak, fried chicken, baked chicken, stuffed green peppers, green beans, mixed vegetables, corn, macaroni and cheese, and cheesy potatoes. Entree and two sides: $5.99; entree and one side: $4.99; entree only: $3.99; and side only: $1.99. 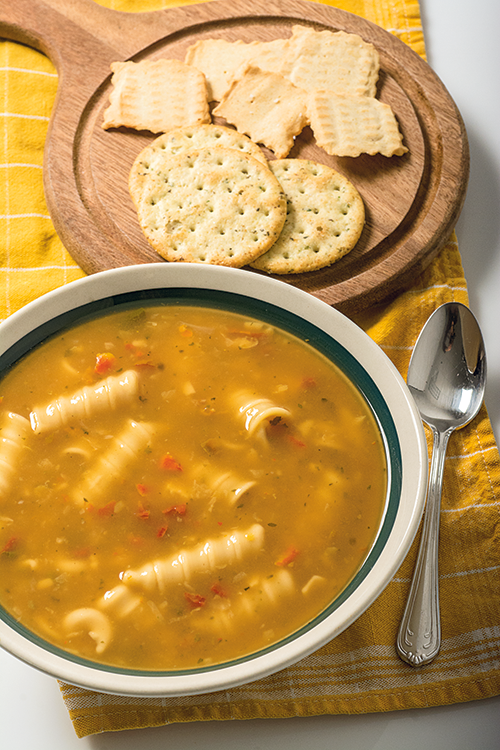 What could be easier than adding water to a dry soup mix? If you are having people over, this is a quick and filling meal. Or you can make it and eat it for a couple of days yourself. When mixed with 8 cups of water, this bag of dry soup mix serves eight people! We liked the Santa Fe Chipotle flavor (pictured bottom right). It’s shown here with the Dare Breton crackers and the Wellaby’s pita chips.